This article was featured in the most recent edition of EMERGE, our quarterly magazine and was authored by our senior writer, Randy Hascall. Click here to read each and every copy of EMERGE digitally. About one-fourth of South Dakota’s farmers are over the age of 65. And many of those have already celebrated their 75th birthday. So, who’s going to take their place when their farming days are done? Based on current trends, those farms will be in good hands. A new generation of farmers is on the way. The USDA’s Census of Agriculture shows that more than 5,300 South Dakotans under the age of 35 were farming in 2012. That’s nearly a 16 percent increase from 2007. When the next ag census compiles 2017 information, all indications are that those numbers will be higher again. The numbers aren’t staggering, but they’re headed in a positive direction. Many of these new farmers are members of the so-called Millennial Generation. Growing up on a farm, they developed a love of country living. Now, they’re returning to their roots for a variety of reasons: Economic opportunities may be better than they were two or three decades ago; their grandfathers may have retired or taken on much smaller roles, making room for them; and there’s also the appeal of new technology, precision agriculture and sophisticated equipment. For some, there’s an opportunity to be their own boss. And of course, there’s the sense of fulfillment that comes with planting seeds, nurturing plants and harvesting crops. These young people are taking different routes, but they all lead to the farm. Some are staying on the farm after high school, some are coming back after working other jobs and some are returning after finishing their educations at a university or technical school. Darrel Woolery, an instructor at Lake Area Technical Institute in Watertown, has seen the number of students in the school’s ag program steadily grow. Woolery, who is in his fifth year at the school, said the number of students studying production agriculture was probably in the low 30s when he started there. This year, there were 75 production-ag students, including about 50 first-year students. Although the largest enrollment is in the school’s ag business option, which provides opportunities with seed companies and other agribusinesses, another option that’s drawing a growing number of students is precision ag. Most of Lake Area’s ag students represent at least a third generation of farming. “The average farmer is 55-plus, so they have to decide if they want the farm to stay in the family,” Woolery said. For Justin Minnaert, who returned to the family farm west of Chester after earning his Lake Area degree in ag business two years ago, there was never any doubt what he wanted to do for a living. Before becoming a full-time farmer, Minnaert decided to continue his education after high school for a couple of reasons. For one thing, he thought it would give him another perspective and new ideas. There are plenty of things to learn and there’s always something new in production. Also, he wanted a degree he could fall back on, should farming not work out for some reason. Minnaert said his dad, Kevin, always made it known he was welcome to come back to the family farm west of Chester, but he never pushed him to do that. Now, as his grandpa Ron Minnaert is phasing out of farming, Justin is phasing in. He said his dad and grandpa are willing to try some of the new ideas and techniques he learned at tech school. He looks forward to the constant challenges that come with grain and livestock farming. 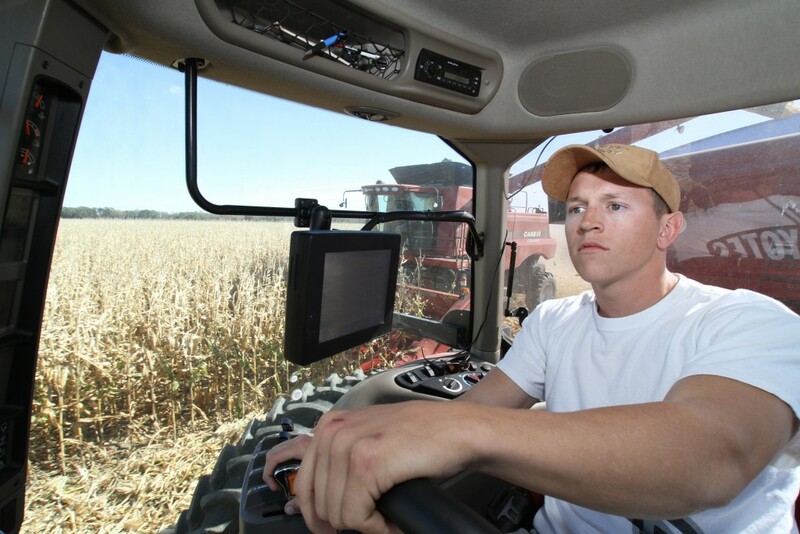 Alex Boekelheide, 21, of Northville earned a degree in ag production from Lake Area Tech last May, then returned to the farm to work with his dad, Mark. He said his parents had made it clear they wouldn’t force farming on him. They wanted him to pursue whatever career interested him. At tech school, he learned new agronomy techniques and gained knowledge that will help in making business decisions, including being involved with hedging and futures markets. “My dad always preached to me that you can add a lot of money to your bottom line,” he said. Boekelheide said it’s a great feeling to plant seeds, put in all the work that’s needed to grow crops and then realize the fruits of that labor during harvest. The Boekelheides raise corn, soybeans and wheat. A family friend, Thomas Twete, is also “part of the team,” and his dad’s brother helps out when needed. Alex said he enjoys farming so much that it doesn’t really seem like work. Scott Stahl, 29, took a different approach in returning to farm in western McCook County. He graduated from Northwestern College in Orange City, Iowa in 2007 with a degree in business administration and emphases in agribusiness and finance. He and his wife moved to Sioux Falls, where he worked first as a credit analyst and later as an ag loan officer at First National Bank in Sioux Falls. He helped out on the family farm during busy times. Stahl worked five years at the bank, then pulled the plug in May 2013 when he got an opportunity to farm additional ground with a business partner of his. His farming opportunity opened up when that extra land became available. “You have to have enough land to cash flow. You can want to come back and farm, but if you only have 40 acres it’s not going to work,” he said. “It’s tough to get opportunities. I feel very blessed to have had this chance to have extra land. Stahl said ethanol production and local demand for corn have increased margins and provided opportunities for farmers like him. In addition to grain production, Stahl and his dad, Charles, have a 500-head cow-calf operation. He said farmers have to be business savvy, much more so than 50 years ago, to make their operations succeed. His banking jobs were an immense help in the financial side of farming. He saw how bankers look at farming operations and he learned about risk management. He also learned about marketing and crop insurance, and had an opportunity to work with the South Dakota Corn Growers Association and USDA Farm Service Agency. He said his sons, ages 5 and 3, had no idea what he did every day when he worked at the bank. This entry was posted in News and tagged Ag Census, agriculture, corn, Lake Area Tech, South Dakota, young farmers. News, in-depth coverage and special alerts. Specifically for South Dakota farmers. ©2019 South Dakota Corn Council and South Dakota Corn Growers Association. All Rights Reserved.